A Kenilworth beekeeper who has inspired hundreds of people to learn about beekeeping has been named a Point of Light by Prime Minister David Cameron. Clive Joyce, 71, of Randall Road, has been an amateur beekeeper for 30 years and decided to start after being inspired by a beekeeping display at the Royal Show in Stoneleigh. Clive’s work is vital in ensuring that bees continue to thrive in Britain. After his wife signed him up to a course in beekeeping shortly afterwards, Mr Joyce devoted much of his life to beekeeping and has helped many up-and-coming beekeepers learn the craft. He said: “The work involved in keeping bees has given me the opportunity to meet people young and old. Mr Joyce, a retired fireman, cares for 780,000 bees of his own and is one of about 15 beekeepers in Kenilworth. He was made an honorary member of the British Beekeepers Association (BBKA) in 2007 thanks to his looking after the charity’s display hives in Stoneleigh Park for over 25 years. The BBKA is a charity that was formed in 1874 and represents 24,000 amateur beekeepers as well as the three billion bees they look after. Its goals include promoting beekeeping and advancing the education of the public in the importance of bees in the environment. Mr Joyce’s work as a member of the BBKA made him eligible for a Point of Light award. The awards are given out daily and recognise outstanding individual volunteers in their community who are making a change, no matter what field they work in. They were developed in partnership with the Points of Light programme in the USA, originally conceived by former President George H.W. Bush. Prime Minister David Cameron said: “Clive’s work is vital in ensuring that bees continue to thrive in Britain. “As well as looking after his own colonies, Clive has encouraged and supported countless other enthusiasts to take up beekeeping, making sure they are trained and qualified. Mr Joyce’s efforts have been recognised not only because of his enthusiasm and hard work but because of the importance of beekeeping to the environment and the economy. Bees are vitally important to the UK, not only for the honey and wax they produce but also because they pollinate around 70 types of crops that farmers grow year after year. Treatment and care provided by beekeepers give native honeybees a better chance of survival, therefore giving farmers a better chance of a good harvest. Currently, the wild population of honeybees is threatened by habitat destruction and disease. 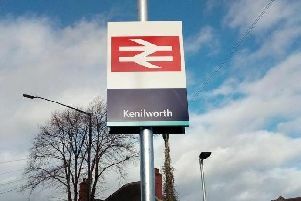 However, Kenilworth is notable for having ideal conditions for beekeeping due to its wide variety of shrubs, trees and flowers compared to the countryside which is dominated by mono-agriculture. If people know someone who they think deserves a Point of Light award they should write to the Prime Minister at 10 Downing Street.